The Institute of International Education (IIE) has ranked Samford 13th out of the top 40 master’s-level institutions for the university’s undergraduate participation in study abroad programs. 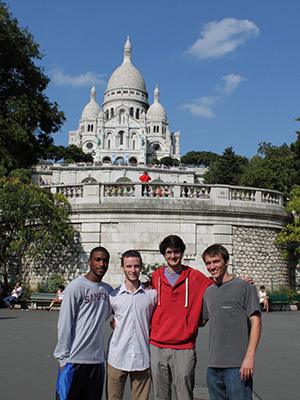 Approximately 276 Samford students participated in Samford’s International Programs for the 2010-2011 period of the ranking. Participation has increased dramatically even since that period, and Samford currently offers more than 50 international study opportunities. Shipley said the growth of Samford’s International Programs growth runs counter to a national trend. “During that same time period, national study abroad participation flat-lined at approximately a 1.3 percent increase,” he said. “Nationally, study abroad has plateaued, and now international educators are asking, "where do we go from here?." With student mobility restricted for many reasons, staying home may be the new going somewhere. “While our numbers have increased dramatically through innovative programming by our faculty, there will surely be a plateau in our future,” Shipley said. “At that point we will have to look at ways of achieving our international goals without using an intercontinental airline.” Shipley said new directions for Samford and other institutions are likely to include innovative ways to provide international exposure at home, including greater international emphasis across the curriculum. Founded in 1919, the Institute of International Education is a private nonprofit leader in the international exchange of people and ideas. In collaboration with governments, foundations and other sponsors, IIE creates programs of study and training for students, educators and professionals from all sectors. These programs include the flagship Fulbright Program and Gilman Scholarships administered for the U.S. Department of State. IIE also conducts policy research, provides resources on international exchange opportunities and offers support to scholars in danger.